The Final Round of Eurobasket Women is between the eight remaining teams in the competition. It is called the final round because there are four places at stake for the 2012 FIBA Olympic Qualifying Tournament for Women (AQT) in a venue yet to be determined. The winner of the < stong> is automatically qualified for the 2012 Olympic Games in London. The teams that finish from second to fifth have to play in the AQT to win a place in the final round of the basketball competition in the Olympic Games. The winners of the quarter-finals of the 2011 edition of EuroBasket automatically book their place in the AQT. So there are likely to be plenty of emotional scenes and tears. The losers of the quarter-finals have to play in the fifth to eighth place competition. It means the winner of the fifth place is awarded the last spot in the AQT. In the first game of the Final Round Russia beat Latvia (83-72) to be the first team in the semi-finals with Maria Stepanova's double-double of 10 points, 11 rebounds and 4 assists while her team-mate Elena Danilochkina top scored with 18 points. Sandra Mandir's 27 points for Croatia were in vain as the Czech Republic led from the beginning of this EuroBasket match to beat her side (79-63) coming up with 6 blocks. All the Final Round games are played in Łódź and you can read the stories of interest from the EuroBasket Women games by selecting the link below. Russia scored the first 7 points in the game and never really looked back. Elena Danilochkina (right) had a strong first half and finished the game as the leading scorer for Russia with 18 points. Marina Kuzina did her drop and popped up when required to add 16 points. Olga Arteshina's clutch shooting enabled Russia to keep the momentum. She finished with 15 points. Maria Stepanova was not allowing anybody a chance in rebounding and finished with a double-double of 10 points and 11 rebounds. For Latvia Elina Babkina was everywhere but she was the only player able to take on Russia. Her 21 points were not enough for her side to take the victory. Zane Tamane was still suffering from her knock in the last group game but still managed to score 10 points, 8 coming in the first half. When Babkina tired Kristine Karklina stepped up and finished with 18 points. Latvia's Olympic dream rests on them now finishing fifth in the 33rd edition of the EuroBasket Women competition. Russia started aggressively and fast with Maria Stepanova winning the tip-off and then scoring the first basket of the game. Russia bulldozed their way to a (7-0) start by dominating Latvia in all sectors of the game. Zane Tamane did break the duck for Latvia but Russia continued their advance. Elena Danilochkina and Olga Arteshina both connected from the land of many which forced George Dikeoulakos to call for a time-out with 4:42 to be played, his team trailing (8-17). Finally Latvia got into their game and with Elina Babkina (right in picture passing under Maria Stepanova) running all over the place they started finding their way to the basket. They outscored Russia 10-2 to trail by a single point with two minutes to play in the first quarter. However Russia once again got the upper hand with another trey by Arteshina. With seconds left to play, she went for an offensive rebound which she did not get. But she ended up hitting her head on the advertising boards. Despite the big bang she got up and raced down the other end. Russia went into the second quarter leading (23-17). Then Russia took full control and opened up a double-digit lead with seven minutes to play in the quarter (35-25). Latvia used up their second time-out and once again with Ieva Kublina and a trey by Babkina were briefly back in the game. For Russia Danilochkina (12 points) hardly put a foot wrong and continued to score to give her team a 15-point lead (45-30) with 3:30 left before the break. Babkina (14 points) refused to be put down by the Russians and continued to attack. She scored the best point of the first half when she ran through the Russian defense and finished with a running jump. On the very next attack she was fouled and hit a couple of free-throws. However Russia finished the quarter with a trey by Arteshina (left), her 10th point of the quarter, to go into the interval leading (48-37). In the second half Latvia got off to a good start with the first 5 points of the quarter. This resulted in Boris Sokolovsky , Russia's head coach, taking a time-out with 90 seconds played. Russia regained control once more and restored the double-digit advantage (55-44) with 6:28 to play. Latvia were once again struggling. With almost six minutes left to play Dikeoulakos called a time-out. Babkina tried to get her team going with a clutch three-pointer but Russia replied on the very next attack with Danilochkina hitting a three-ball. 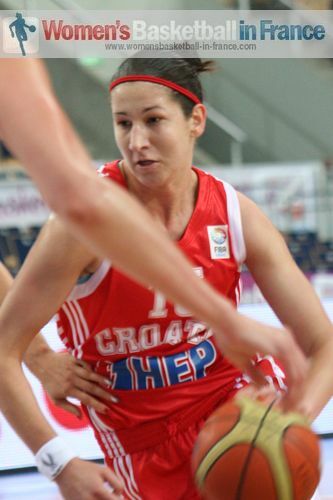 Russia exteneded their advantage (61-47) after 26 minutes of play with 2 points by Ilona Korstin. Latvia were unable to bring down the deficit despite a couple of treys by Liene Jansone and went into the final quarter trailing (55-65). Latvia needed other players to step up offensively as time was running out. Sabine Niedola and Kristine Karklina responded. However a trey by Arteshina and back to back scores from Marina Kurzina kept Russia in charge (74-61) with six minutes remaining to play. There was no miracles for Latvia and Russia ran out winners (83-72). The two teams started rather cautiously with the Czech Republic leading (7-4) after four minutes of play. Veronika Bortelová lit things up with a big three-pointer for the Czech Republic. Although Mirna Mazic responded with a trey for Croatia, the Czech Republic were about to take off. Within a twinkle of an eye the Czech Republoc had outscored their opponents 11-2 to go (21-9) ahead. Croatia managed 6 points in the last 54 seconds to reduce the deficit at the end of the quarter (13-21). The Czech Republic started the second well to open up a double-digit lead with 13 minutes played (25-15). Stipe Bralic from Croatia called a time-out. Afterwards his players worked up with back to back scores from Antonija Misura and scored 14 unanswered points in a five-minute spell to make it a 2-point game (29-32). However the final two minutes of the quarter belonged to the Czech Republic as the pendulum swung again. Ilona Burgrová and Eva Vitecková (left) scored for their side to go into the locker room with a 7-point lead (36-29). Bortelová and Katerina Elhotova were quickly into their stride at the start of the second half and the Czech Repubic were back in control (45-31). Stipe Bralic, the coach of Croatia, decided after two minutes to call the first time-out of the second half of the match. Whatever he said had an effect with Jelena Ivezic and Mazic getting to the free-throw line to score. Sandra Mandir (right) then fired in a shot from her favourite position from behind the arc. However once again Elhotova came up with something from nothing to score for the Czech Republic. One again the Czech Republic wrestled the control back. With Petra Kulichová doing the initial damage the 5-point lead increased to 10 points. The Czech Republic were in their element and it was almost like watching poetry in motion as they moved 16 points clear (56-40) with just over 27 minutes played. Bralic used his second time-out of the quarter to stop the leakage. This time his words made no difference and the Czech Republic completed a 22-0 run with a fast break buzzer lay-up by Elhotova (67-40). The game was over as a contest but the Czech Republic completed the 24-0 run and continued to defend hard. Katerina Bartonova came up with an impressive block (rejection). The Czech Republic were leading (75-49) with about five minutes to play. The introduction of Alena Hanusová with five minutes to play was the start of the bench players from both teams coming on to complete the game. Olivier Derywez and Romain Goudeshooft produce audio interviews for various organisations and helped the French Basketball Federation during the 2010 FIBA World Championship for Women. They caught up with Ana Lelas after the game on behalf of womensbasketball-in-france. Ana Lelas plays for Montpellier in France and is a Croatian international. Unfortunately her EuroBasket Women is over due to ligament damage during the game against Latvia, un injury that will keep her off the court she hopes for no longer than three weeks. She explains that Croatia did not start the European Championship well against France but they picked up afterwards in winning the important matches against Greece and Poland and Spain to qualify for the final round (Top 8). As for the match against the Czech Republic it was difficult despite the fact that they had beaten them in a friendly match. But in this game they were unable to impose their game and did not perform as the coach asked. She concludes that this match should be the wake-up call for the next game against Latvia as they would like to reverse the 15-point loss from the preliminary round.